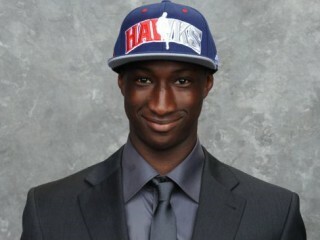 Pape Sy, born Pape Ousseynou Sy is a French-Senegalese basketball player who is a member of the Atlanta Hawks of the NBA. A versatile combo guard/swingman, Sy was drafted by the Hawks as the 53rd overall pick in the second round of the 2010 NBA Draft after spending five seasons with STB Le Havre of the Ligue Nationale de Basketball. Signed with the Hawks on September 15, 2010 . • Drafted by Atlanta in the 2nd round (53rd overall) of the2010 NBA Draft. Played for the Hawks in the 2010 NBA Summer League in Las Vegas, averaging 4.5 ppg, 1.0 rpg and 1.0 apg in two contests (.333 FG%, .778 FT%). • Recorded 2.4 ppg, 0.4 rpg, 0.4 spg and 0.3 apg (.462 FG%, .333 3FG%, .500 FT%) in seven games in 2007-08. • Names Alicia Keys as his favorite musical artist.